The Colorado Rockies dropped into a tie with Los Angeles for the NL West lead with only one game left, routed by Stephen Strasburg, Juan Soto and the Washington Nationals 12-2 Saturday night. DENVER (AP) — The Colorado Rockies dropped into a tie with Los Angeles for the NL West lead with only one game left, routed by Stephen Strasburg, Juan Soto and the Washington Nationals 12-2 Saturday night. Hoping to hold their one-game edge, the Rockies instead saw their winning streak end at eight. The Dodgers were 10-6 winners in San Francisco earlier, ensuring the race will go down to the wire. With game No. 162 on deck, the Rockies (90-71) are attempting to accomplish something they’ve never done since entering the league in 1993: capture a division title. If Los Angeles and Colorado finish tied, there will be a one-game tiebreaker for the West title Monday at Dodger Stadium. The loser will become a wild card. Colorado celebrated earning a postseason spot Friday night, even breaking out the bubbly. 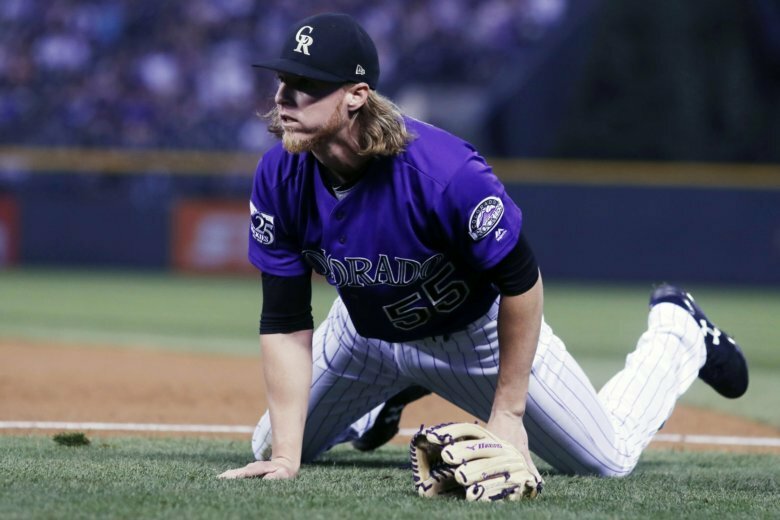 But the team looked flat from the start as the Nationals grabbed an early 5-0 lead on Jon Gray (12-9) to zap the energy from a sellout crowd at Coors Field. Gray’s night started in a painful way when he was drilled in the side by a liner from Adam Eaton on the second pitch of the game. Gray remained on the mound, but was ineffective. He was tagged for five runs in two innings before being lifted for a pinch hitter. Soto set the tone with a two-run double in the first and Trea Turner added a two-run homer an inning later. The 19-year-old Soto also lined a solo drive to right in the fifth. He has 22 homers this season, tying him with Bryce Harper (2012) for the second-most by a teenager. The record is 24 by Boston’s Tony Conigliaro in 1964. Soto added another RBI on a groundout in the eighth. Strasburg (10-7) effectively mixed his fastball with his change to hit double-digit wins for the fifth straight season. He struck out seven and allowed two runs on solo homers by Carlos Gonzalez and Nolan Arenado over six innings. Washington was able to keep David Dahl in the park, which has been no easy feat these days. Dahl’s streak of homering in five straight games was ended. The win assured the Nationals of finishing with a winning record for a seventh straight season. Nationals: Manager Dave Martinez won’t take any risks with INF Ryan Zimmerman’s sore back. “The last thing I want to do is have him re-injure himself really bad and have to rehab for two months over the winter time,” Martinez said. Martinez signed off on outfielder Victor Robles’ desire to play winter ball. Robles missed time earlier this season with an elbow injury. LHP Tyler Anderson (6-9, 4.76 ERA) is set to start for the Rockies. Max Scherzer (18-7, 2.53, MLB-high 300 strikeouts) had been expected to pitch for the Nationals, but it will be RHP Erick Fedde (2-3, 5.24).